Eight Years of Teaching in Sandoval County of Dora C. De Baca Romero. Interviewed her on July 24, 1992. 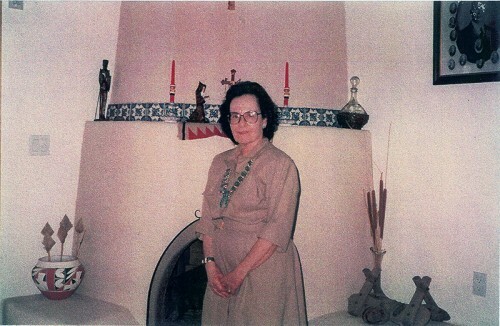 Jane Sanchez picture was taken at Dora’s home in Los Lunas on July 24, 1992. On right hand corner of picture you see a picture of Dora’s husband’s grandfather (Boleslo Romero) of Los Lunas—who was in the FIRST SENATE in 1912. Article of July 11, 1991, that appeared in the (Albuquerque) Journal and written by Slim Randles says it all. Most of my teaching was done in “Units of Study” written by me and put on charts. Sometimes these units were done by trips to Albuquerque. Such as “Airport”, “Train Station”, “Zoo”, “Parks”, “Fire Station”. Units made on “The Family”, “Farm Animals”, “Pete”, “Picnics”, etc. Units such as holiday, “Arbor Day”, “Armistice Day”, “Thanksgiving”, “Christmas”, “Easter”, “End of School”. Programs and poetry, written for the particular holidays. Science units such as Air, Water, Clouds, Rain, Snow, Wind, Storms, Hurricanes, Tornadoes, etc. Units on the environment and beauty of nature – Mountains, Rivers, Lakes, Farm, Surroundings (Keeping it clean). Units on socializing – Friends, Getting Along with People, Manners. Units on discipline – such as Hard Work, Trying to Do Your Best, Keeping Yourself and Your Surroundings Clean. Pride in Your Work, Yourself, Your School and Your Home. Units on responsibility – Having To Do Chores at Home. Making stories on different children and what they did at home and at school. Units on stories read to the children by the teacher, written in simple words that all could read. Units on harvesting and how they helped. Picking Fruit and Drying it, Chili, etc. Units on Piñon Picking. Children would tell their stories of how they gathered piñon for the winter. Units on health – Keeping clean, eating fruits and vegetables and how those things helped them. Dressing warmly in winter, playing in the snow. Visitors that dropped by the school. Stories about tools and things used on the farm – wagons, hoes, rakes, shovels, etc. Units on rhyming words picked up from different units. Units on games played in the school. The upper grades teacher and I organized a basketball team and would arrange games with the different villages around Jemez Springs, Vallecitos, San Ysidro. People would come to see the games and we would write about it. The first year was pretty rough teaching in my Dad’s old house. My classroom was in the big hall of the house. Hardly no materials to work with. 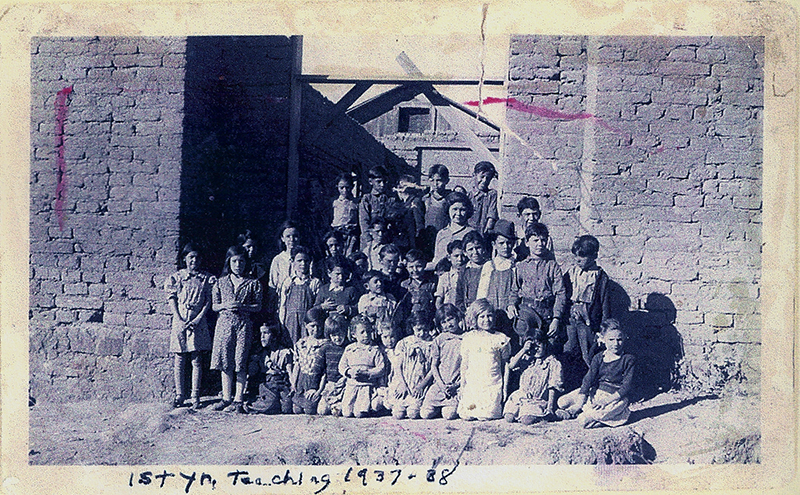 Dora C’ De Baca Romero and students in her first year of teaching at Cañon School in 1937. 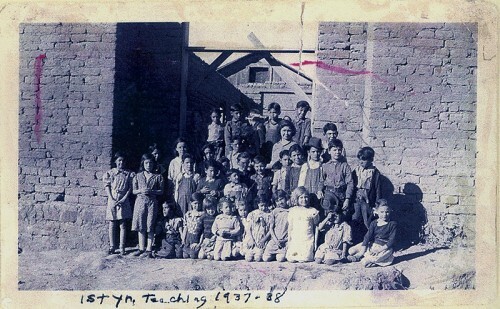 Picture was taken in front of WPA school that her father, Manuel C’ De Baca as building. The following year the new WPA school was finished. My Dad built it (Manuel C. De Baca). WPA means Works Projects Administration (during the Franklin D. Roosevelt administration). It was a two-room school. My mom made new curtains for my windows. My Dad sanded and waxed the floor and made me chart racks and bulletin boards. Everything (expense) came out of my own pocket. I made my room look like the classrooms I had seen in Albuquerque and in which I had done my practice teaching. Thanks to UNM and the fine training they gave me. Dr. Tireman in the Education Department (very strict) was the person in charge of our practice teaching. My Dad was very political. He would involve me for the elections. He was usually the judge and I the secretary. He rubbed some people the wrong way and they would take it out on me. One time the whole State Board of Education came to observe me. I didn’t know that they had come to check on me. Petitions had been gotten saying that I wasn’t teaching right. That I had taken a pig to school, etc., etc. When they left they told me that they were very impressed. They enjoyed the stories on the pig. When I went to pick up my check the following month, my salary had gone up to $30.00 a month, from $60.00 to $90.00. So they did me a favor. Some people appreciate my work. In 1990 when my son and daughter-in-law came from England, I took them to show them my childhood surroundings. We stopped at the church in Jemez Pueblo and this beautiful, young, blonde girl waited on me. I had stopped by the church to find out something about my grandfather Seferino C. De Baca. The girl said, “Oh, you used to be C, De Baca?” I said, “Yes.” She said, “My grandmother used to tell us about this beautiful young girl named Dora C. De Baca that taught at Cañon and did wonders with the kids.” I said, “That young girl was me, but I wasn’t beautiful.” It sure was nice to hear that someone thought I was doing good in those days. As I said, my Dad was very political. I could have run for school superintendent and won by a landslide. Johnny Archibeque that had been a student in the upper grades when I started teaching there, took my place and ran and won.